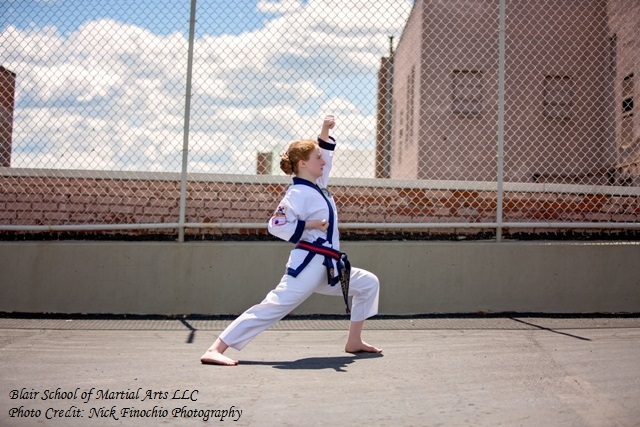 Blair School of Martial Arts teaches traditional Tang Soo Do, a Korean martial art style. Our school offers a family-friendly martial arts training and learning environment, where everyone can learn the many benefits of a traditional martial art. Classes are available for children, youth, and adults. Our minimum starting age is 5 years old. Students can attend up to three classes per week per month. Contact us today for information regarding our affordable rates and special discounts. Contact us today at 814-650-7306, or stop by during our class times, to join our school! We also offer private lessons for students wishing to gain extra practice and improve on skills learned in class. Students must be enrolled in regular group classes to participate. Private lessons are by appointment only, and are subject to schedule availability. If interested, contact us for further details regarding cost per session and schedule availability. In order to be promoted in rank, students must not only display understanding of proper Tang Soo Do techniques, but must also display understanding and practice of proper Tang Soo Do spirit, attitude, respect, discipline, and dedication, as well as meeting the approval and recommendation of the instructor. Our belt ranking system teaches commitment, patience, and dedication. For example, it takes approximately four years to achieve the rank of first-degree black belt. Students are encouraged to put forth their best effort and to always strive toward achieving their goals! Our Kickboxing classes are cardio and fitness based, incorporating techniques from Tang Soo Do and Kickboxing. Have fun while learning basic self defense skills and improving your overall fitness level. Build confidence, relieve stress, set and achieve goals, and improve your overall strength and fitness by joining our school. Contact us today for information regarding our affordable rates! Special Intro Offer for New Students: Receive (3) Classes and (1) Pair of Boxing Gloves for only $25. Call 814-650-7306 for more information on how to join! We are located at 5410 6th Avenue, Suite 7, Altoona, PA 16602, in the left building by the Core Physical Therapy complex across from St. Rose of Lima School.